Today is officially the last day of 2016 and I thought what better way to end the year than with my favorite nail art that I have done this year. I'm not sure if this year I did more nail art or more swatching. Either way you look at it I have done a lot of manis! Like with all other favorites posts of mine, these aren't in any particular order. 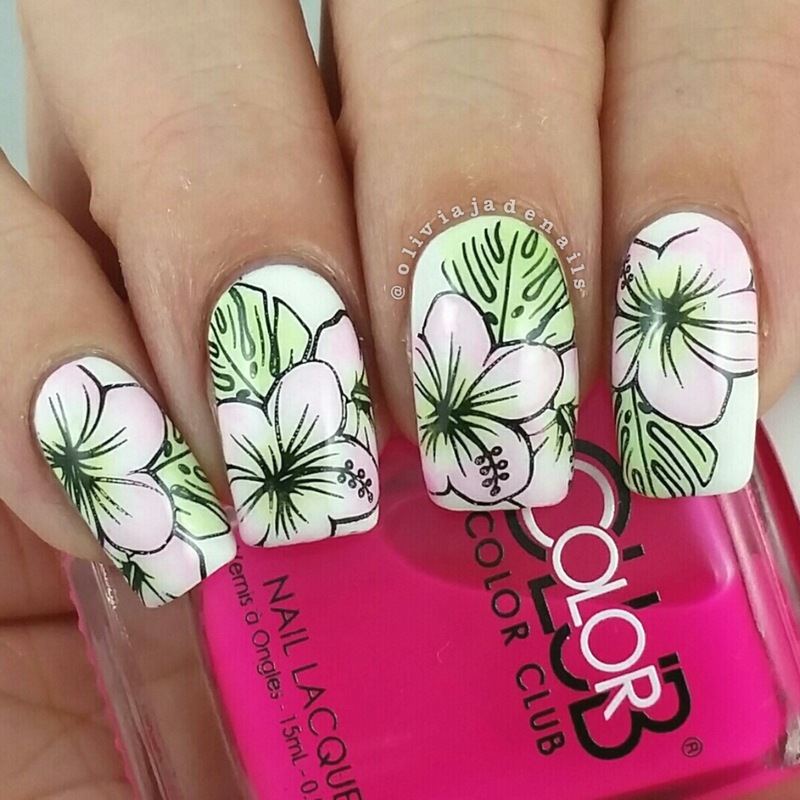 So without further ado, here are my top 25 favorite nail art manis for 2016. 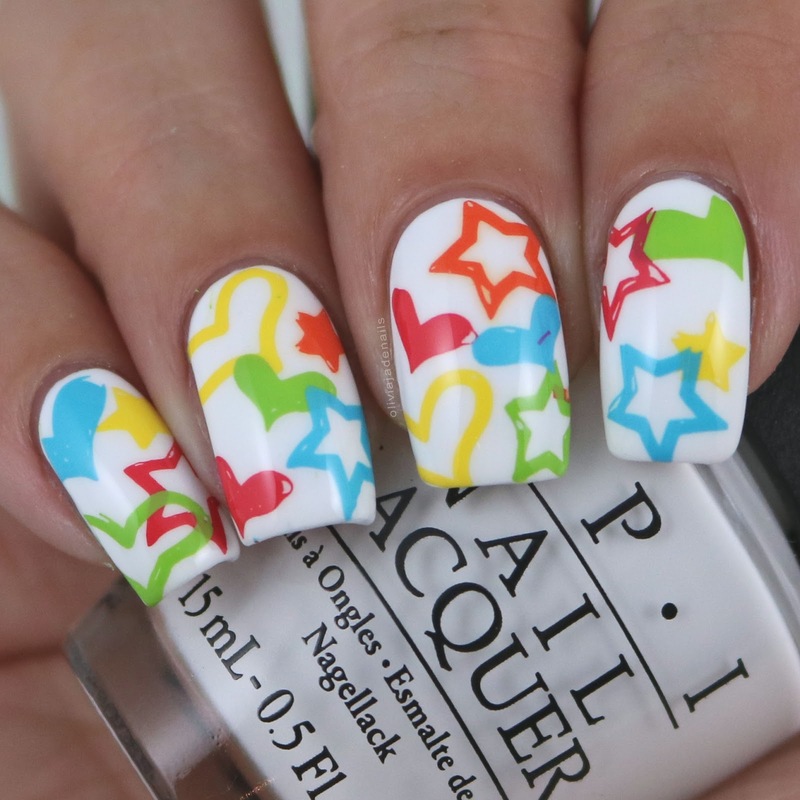 This mani is probably my all time favorite mani that I did last year. I absolutely love everything about it. For my base I smooshed China Glaze Purple Panic, Flip Flop Fantasy (the new version) and Thistle Do Nicely, and then stamped Konad Black using the butterfly image from Uberchic Spring Yay plate. Polishes used are Dance Legend 11 (Velvet Mini), Celestial Cosmetics Midas and Konad Black. 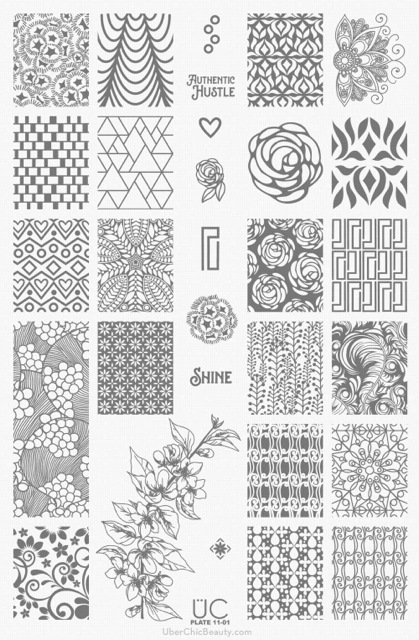 Stamping design is from Bundle Monster BM-XL108. Fun fact about this mani: it was actually an accident. I had originally planned to do the gold stamping only but didn't like how it looked so added the black in hopes of not having to re do the whole mani. Accidental double stamping lol. I always love a good sponged base! Polishes used are Dance Legend 653, 656, 657 and 658 over OPI Alpine Snow. 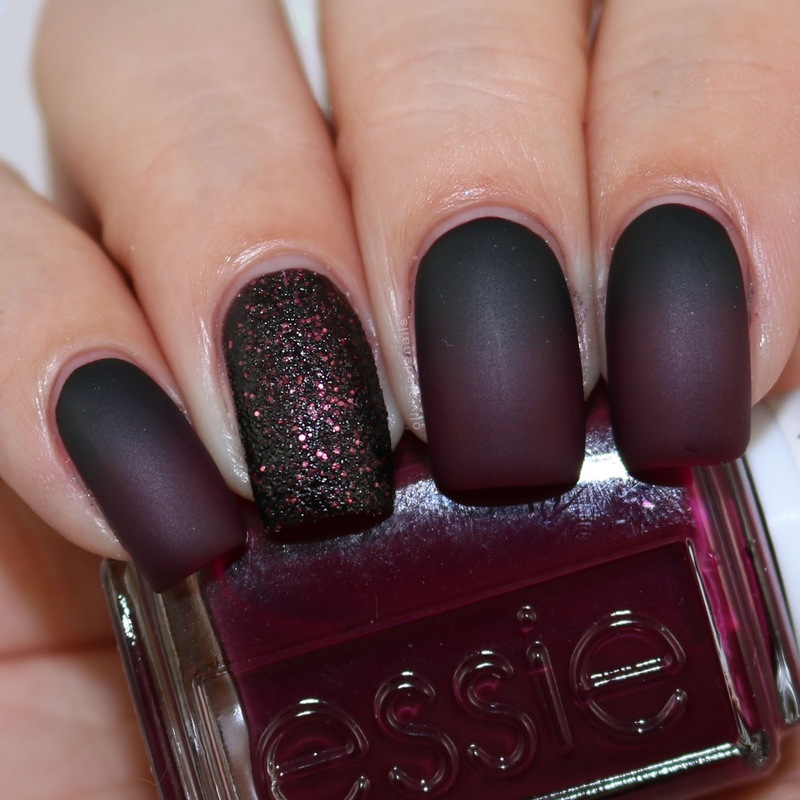 This is one of those manis that was heading towards being a nail fail. The gradient didn't look good at all. I then decided to stamp over it and fell in love with the result. 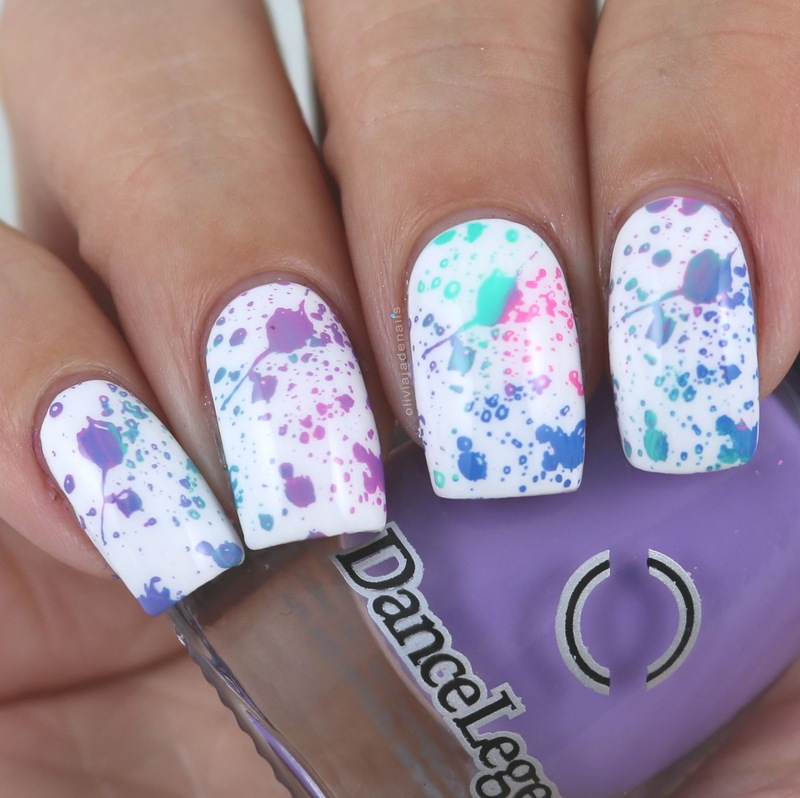 Polishes used are China Glaze Purple Panic, That's Shore Bright (the new version) and Dance Legend 541. 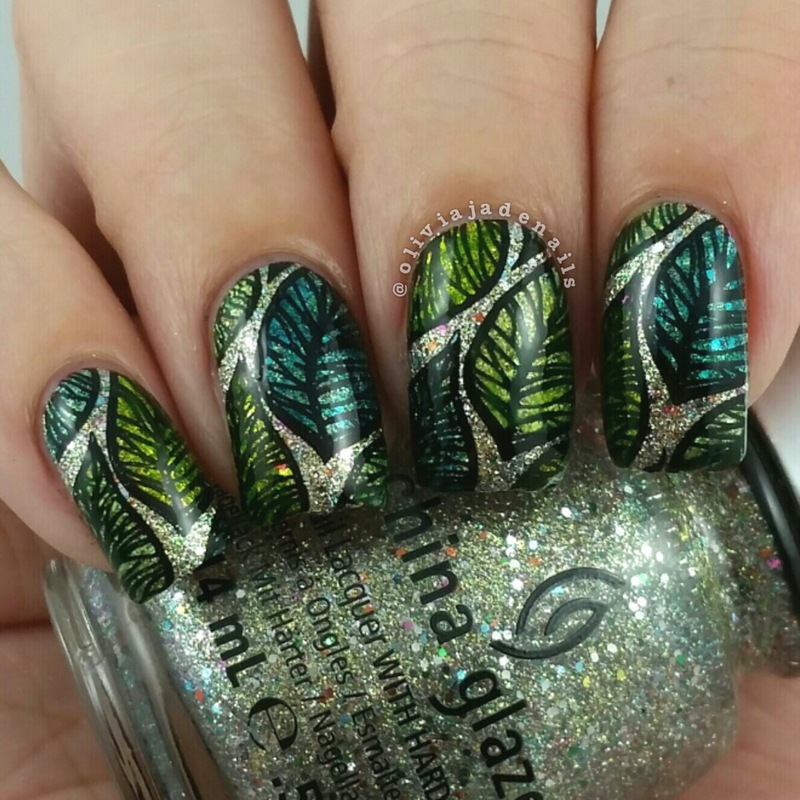 Stamping polish is Konad Black and stamping image is from Pueen's Nature Lover 01 plate. Polishes used are China Glaze Release, CG In The City, Celestial Cosmetics Apocalypse and Konad Black. 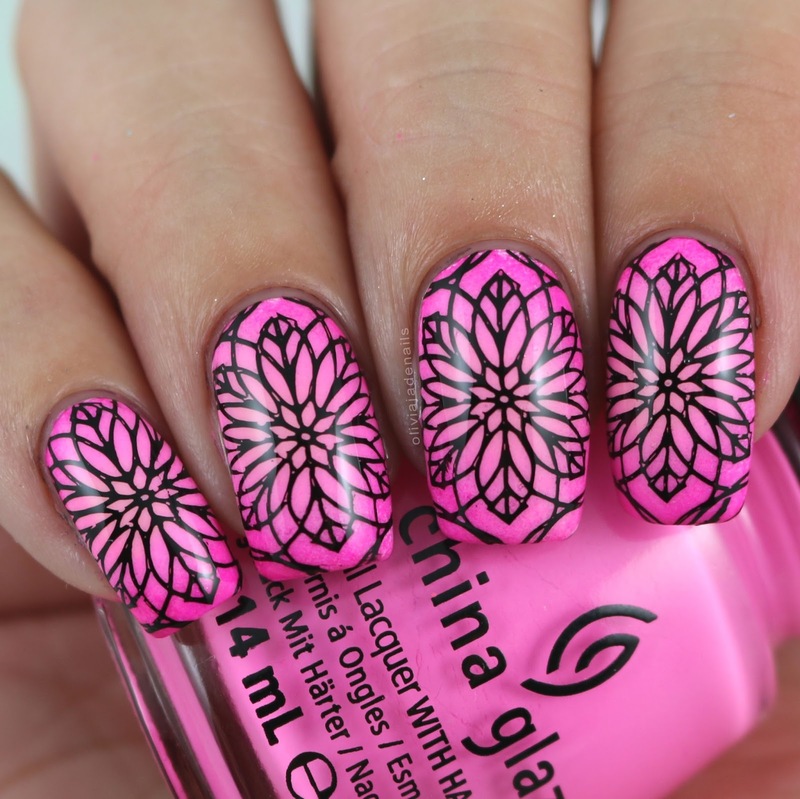 Stamping design is from Uberchic's Wild West 02 plate. This next mani was my 2000th post on Instagram. It still amazes me that I have over 2000 nail pictures on IG. That's a whole lot of polishing! And to think that isn't even all of the manis that I have done in the last few years. For my base I used OPI Alpine Snow and then dry brushed on China Glaze Purple Panic and Flip Flop Fantasy. I stamped Uberchic's Wild West 02 using Powder Perfect's Black Stamping Polish. Polishes used are OPI Alpine Snow (base) and the entire Retro Summer Collection. 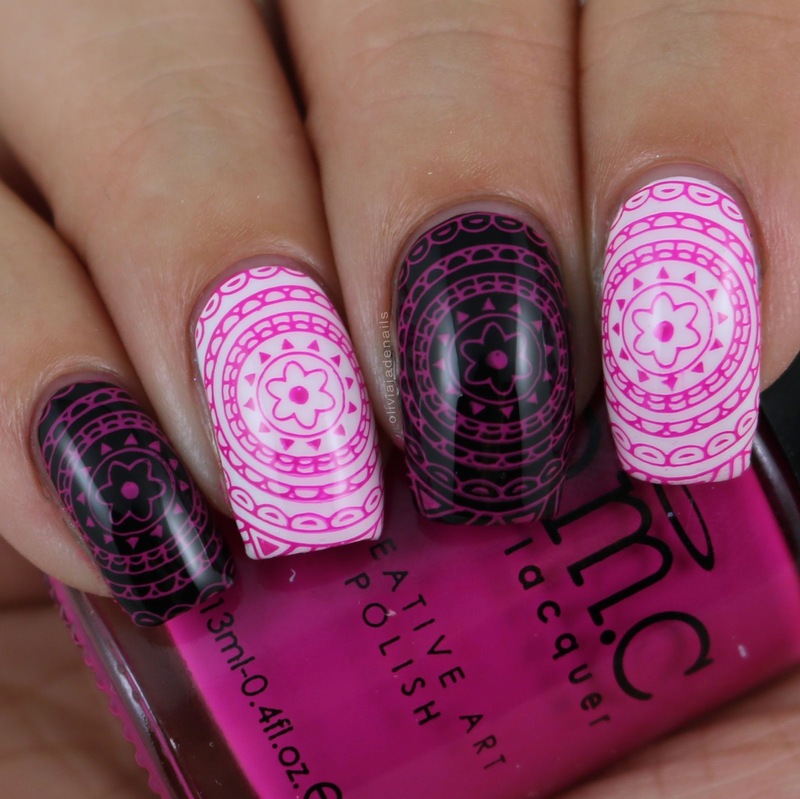 Stamping done using Cici&Sisi Geometry 02 and Powder Perfect's Black Stamping Polish. 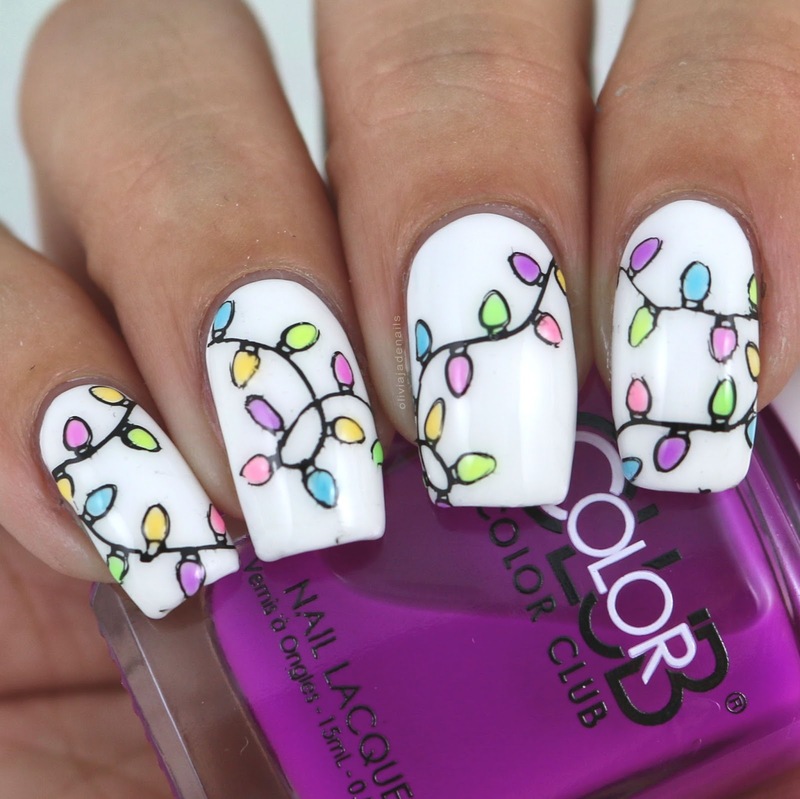 This next mani also happens to be my most liked mani on Instagram for this year. For my base I sponged on Orly's Road Trippin, Push The Limit, Put The Top Down and Scenic Route over OPI Alpine Snow. Stamping done using Uberchic's Lovely Leaves plate and Powder Perfect's Black Stamping Polish. 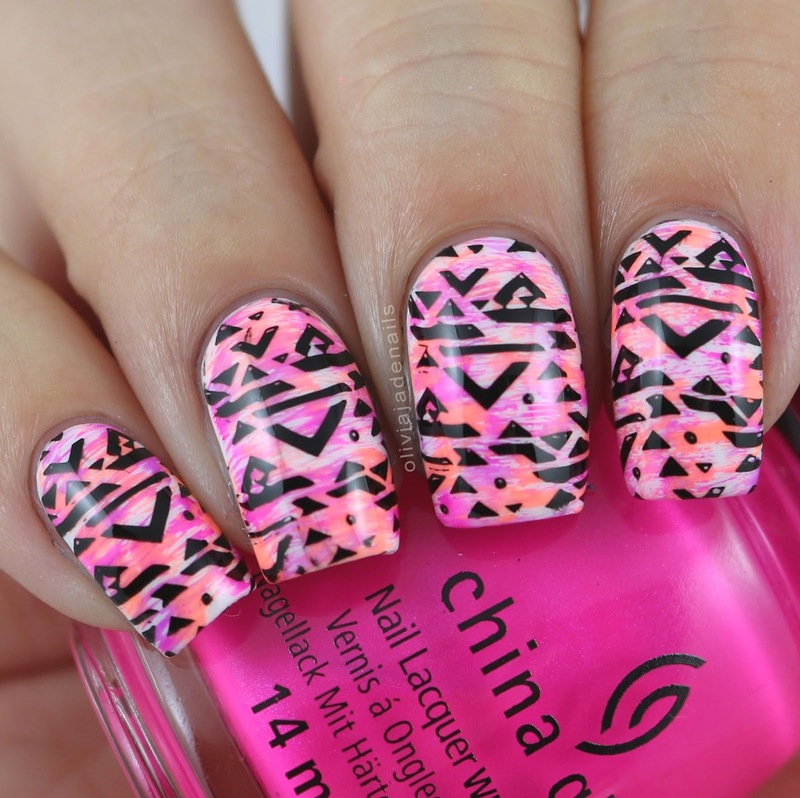 For my base I used China Glaze Concrete Catwalk and stamped using Powder Perfect's White Stamping Polish. Stamping designs are from Uberchic Halloween 01. Polishes used are Essie In The Lobby, Pretty Serious Cosmetics Absence and OPI Stay The Night. Matte Top Coat is also from OPI. For my gradient I used China Glaze's Too Yacht To Handle and At Vase Value over OPI Alpine Snow. 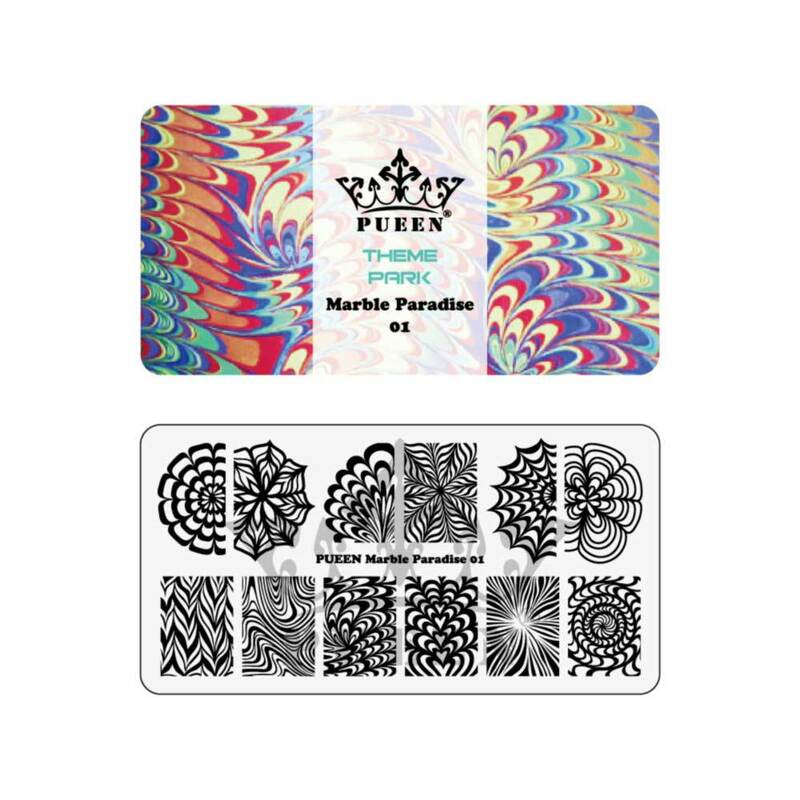 I stamped the image from Lina Nail Art Supplies Make Your Mark 01 with Powder Perfect's Black Stamping Polish. Matte Top Coat is from OPI. Polishes used are Color Club East Austin, OPI Alpine Snow and Powder Perfect's Black Stamping Polish. 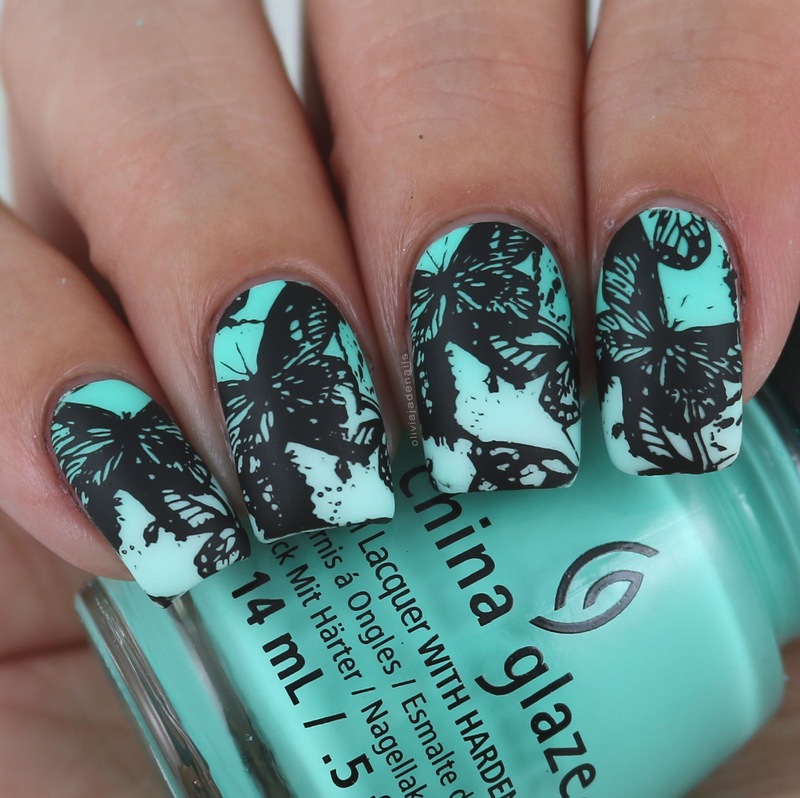 Stamping design is from Lina Nail Art Supplies In Motion 01. For my base I used Sienna Byron Bay and then double stamped the image from Uberchic Texture-licious using Powder Perfect's Black and White Stamping Polishes. For my gradient I used Pretty Serious Cosmetics Cutie Patootie, Fluffykins and Peachie Poo over OPI Alpine Snow. 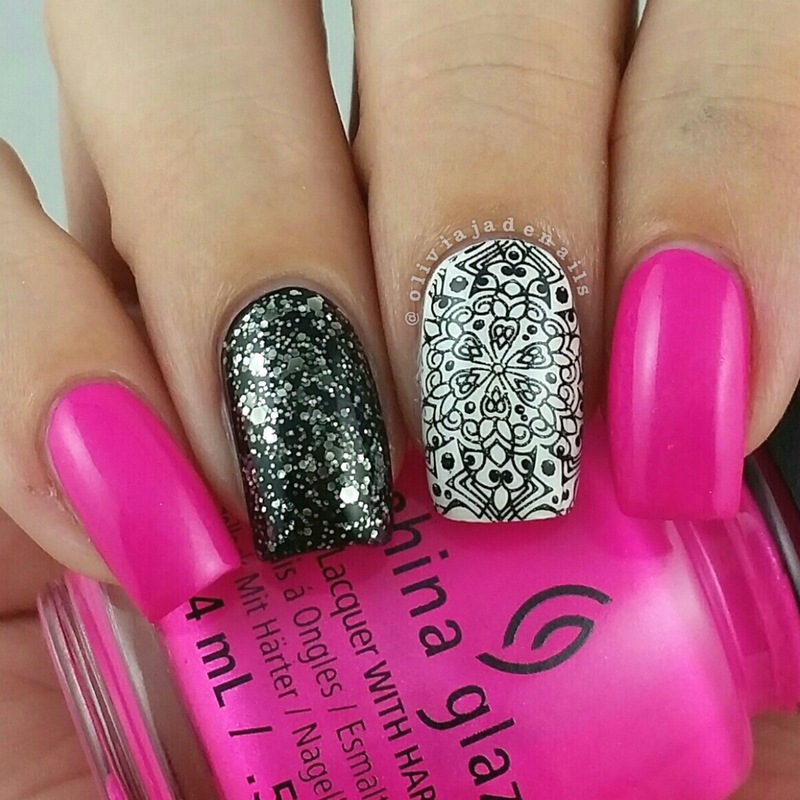 I then stamped Lina Nail Art Supplies Feeling Shapely 05 with Powder Perfect's Black Stamping Polish. Polishes used are China Glaze Purple Panic, OPI Metallic 4 Life, Alpine Snow and Konad Black. 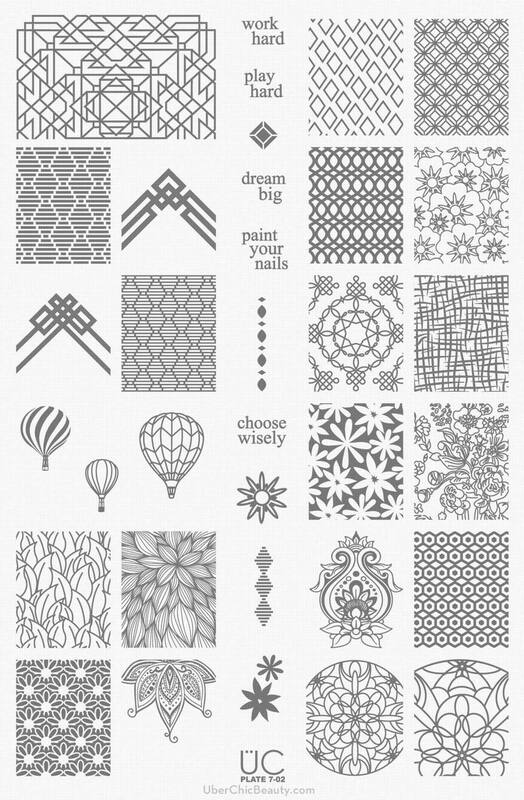 Stamping image is from Uberchic Spring Yay plate. Polishes used are China Glaze Plur-ple, Purple Panic, Flip Flop Fantasy and Daisy Know My Name?, OPI Alpine Snow and Konad Black. 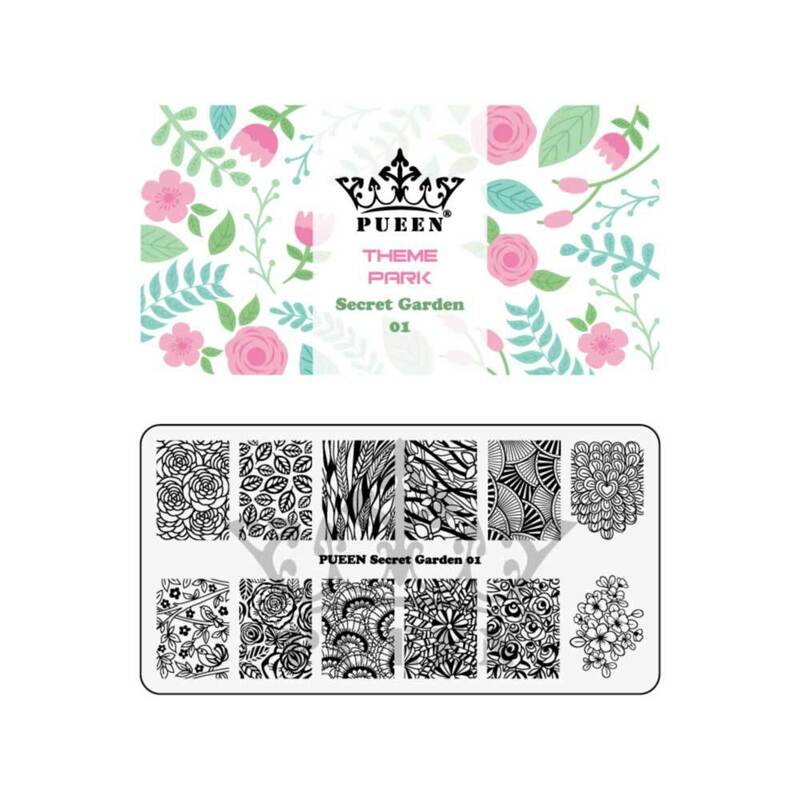 Stamping design is from Pueen's Nature Lover 01 plate. Base is China Glaze Ray-diant, and green tints are from OPI, Emily de Molly and Powder Perfect. 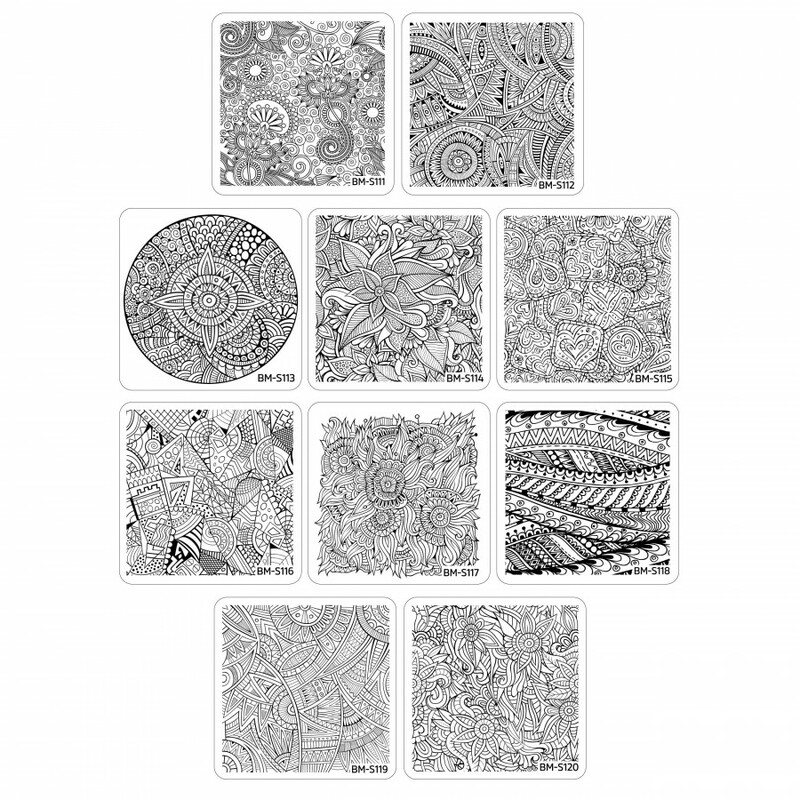 Stamping design is from Bundle Monster BM-S226. For my base I used OPI Alpine Snow and sponged on Orly Window Shopping, Hip and Outlandish, Vintage and Push The Limit. Stamping done using Konad Black and Bundle Monster BM-XL204. For my radial gradient I used China Glaze Feel The Breeze, Bottoms Up and Purple Panic over OPI Alpine Snow. I then stamped Emily de Molly's EDM33 with their Black Stamping Polish. Polishes used are OPI Mod About You and Sunrise...Bedtime! Stamping done using Powder Perfect's White Stamping Polish and Uberchic Christmas 01. 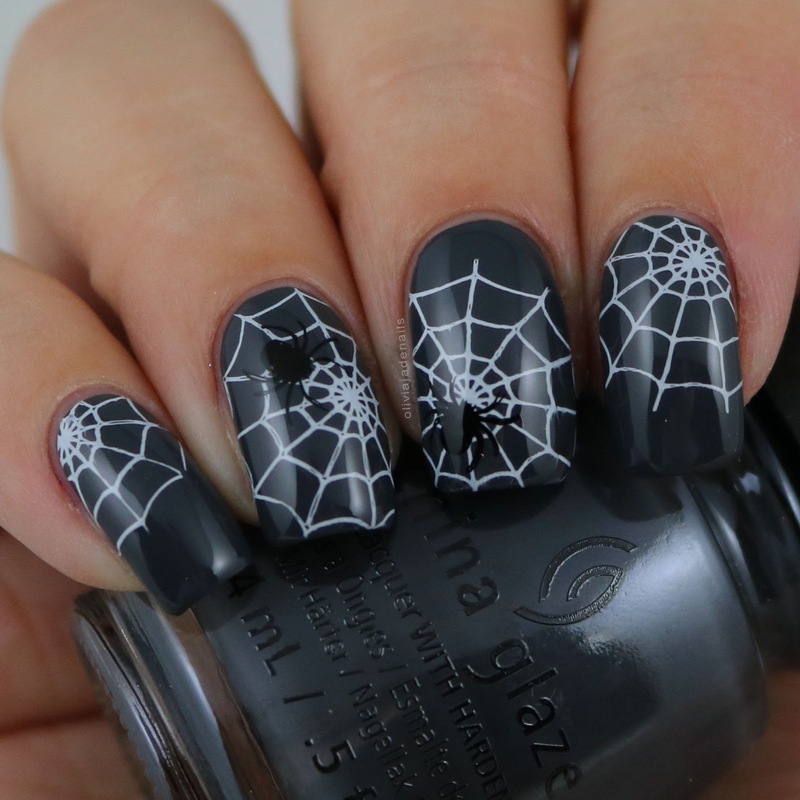 For my base I used OPI Alpine Snow and stamped using Powder Perfect's Black Stamping Polish. 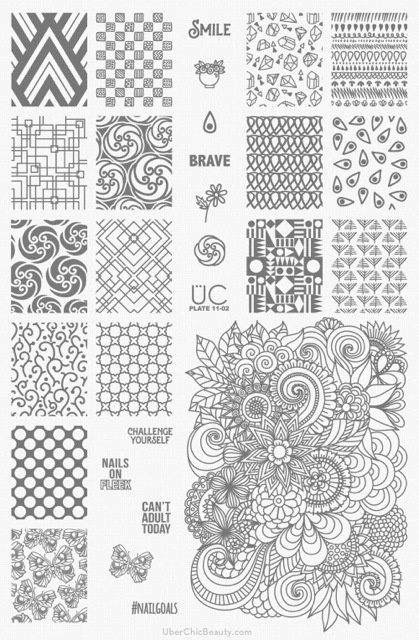 I then filled in the image using the entire Pop Wash Collection from Color Club. 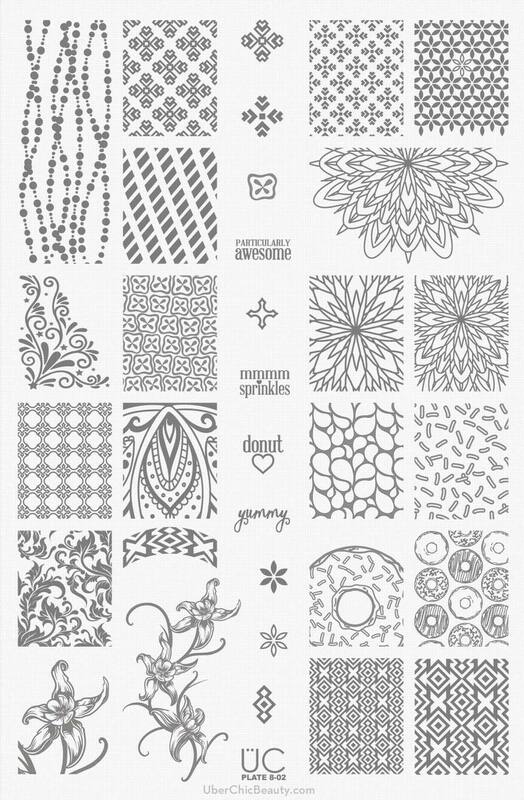 Stamping design is from Uberchic Christmas 01. Polishes used are OPI Alpine Snow, Dance Legend Banana Party, Best Vacation and Umc Umc Baby and stamped using Powder Perfect's Black Stamping Polish. 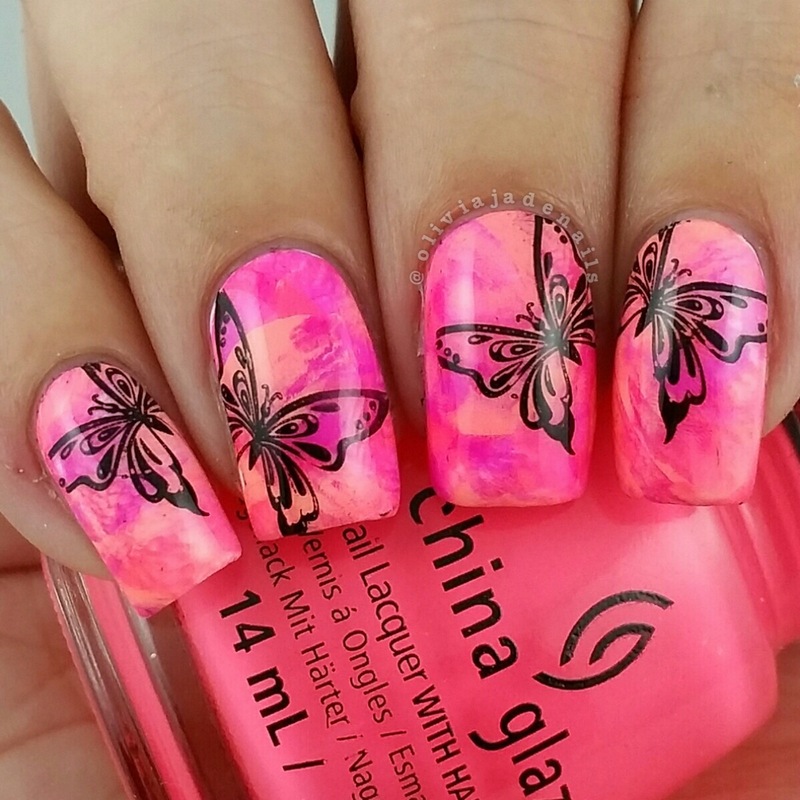 Stamping design is from Uberchic 13-01. For my base I used OPI Alpine Snow and then sponged on OPI That's Hula-rious, Sailing & Nail-ing, Towel Me About It and China Glaze Lotus Begin and Spring In My Step. Polishes used are Color Club's East Austin, OPI Alpine Snow and Black Onyx. Stamping done using BM-XL204 and Konad Black. For my base I used OPI Alpine Snow and stamped using Konad Black. I then used Color Club's Hello Sunshine, Flushed and Just Dew It to fill in the image. I am happy overall with my nail art this year. There was definitely a few questionable manis in the mix too but they all can't be awesome can they? 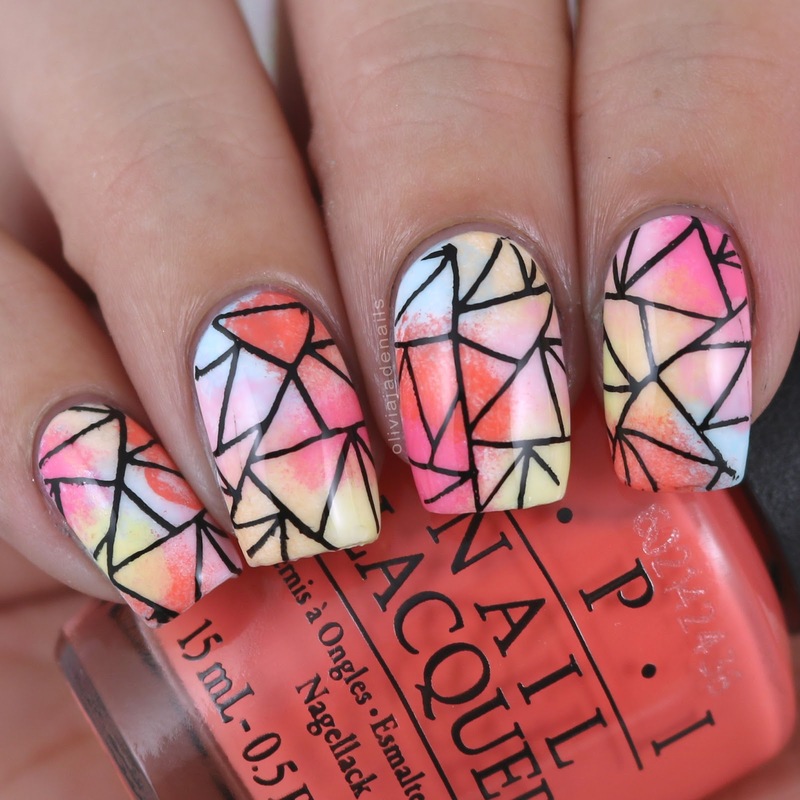 I am looking forward to getting back into nail art. The end of this year certainly tested my patience when it came to nail art, but hopefully next year will bring lot of motivation and inspiration for nail art. On a completely different note, I just want to thank everyone for their support both on my blog and on my social media pages. You are amazing! I hope you enjoy the rest of 2016 and have a great start to 2017. I know I am looking forward to the new year and all the good things it will bring. See you all next year! My number one favorite nail art technique is nail stamping. You saw my favorite nail stamping polishes yesterday, and today I will be sharing with you my favorite plates that have been released this year. I nearly think that deciding which plates were my favorite was harder than picking my nail polish favorites and that was hard! But I think I have managed to do it. These plates were all released this year (or at least I think they were), are ones that I own and have used and the majority of the plate has images that I love. There are a few plates that I haven't included because there was only a couple of images that I love. Now this is going to be quite a lengthy post but I will try and keep my chit chat to a minimum. I will include links to all the relevant blog posts if you are wanting to see how I used the plates. Like with all of my other favorites posts these aren't in any particular order. 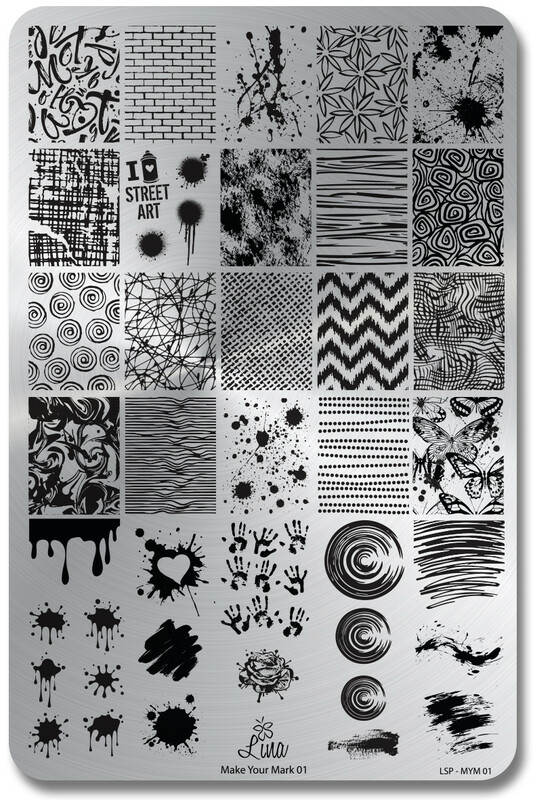 Bundle Monster are the first brand of stamping plates that I ever purchased and I have pretty much been collecting all of their plates ever since. They have a great mix of images and are a good quality. 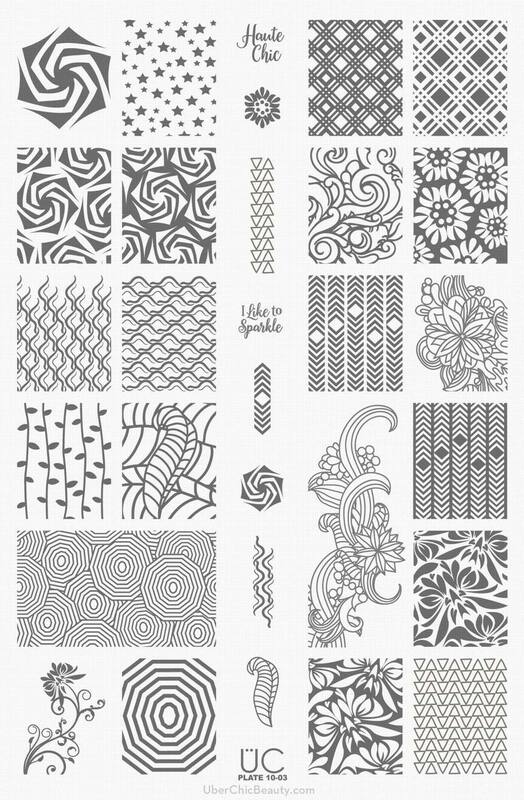 Paisley Flow Collection. Yes I am aware that I am meant to pick on plate or just a few but I honestly couldn't so it was just easier to put the whole collection (you can see the images in more detail here). I love this collection. Initially I wasn't a fan of buffet style plates but they are actually really easy to use. You can really just grab from anywhere off the plate without having to worry about lining things up etc. BM-XL218 This plate is from the Blogger Collaborations Set Four. Now I haven't actually done a blog post of this set yet (oops) so will definitely need to add that to my list of posts for next year. 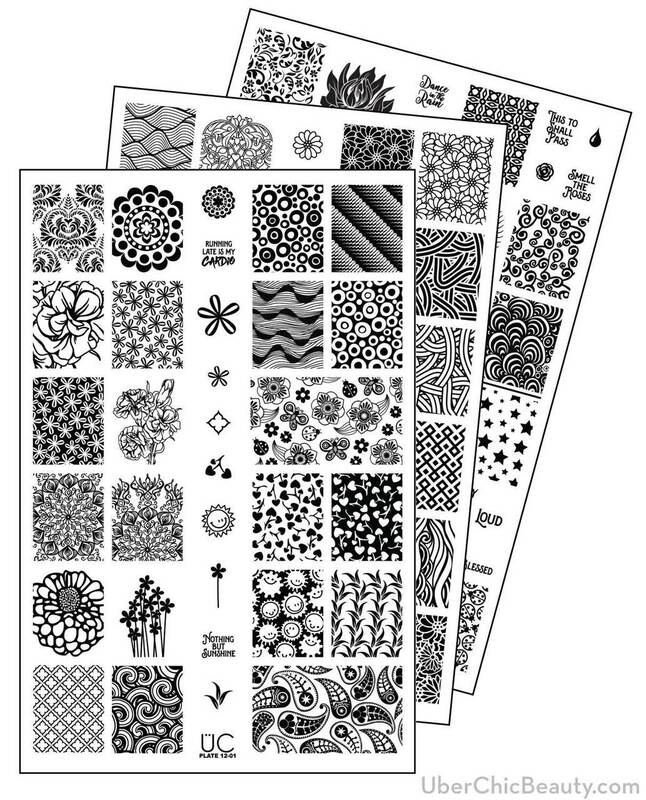 Lina Nail Art Supplies is the newest brand to enter my nail stamping collection. I have completely fallen in love with their plates (and at the time of writing this I am currently waiting for my order to arrive which has the bulk of their plates that I am missing. So prepare yourself for lots of Lina posts next year). Their plates are great quality and seem to have more full sized images which are my favorite sort of images to use. Feeling Shapely 01. You can see the blog post for this plate and the next plates here. In Motion 01. You can check out my blog post here. Mark Your Mark 01. You can check out my blog post here. 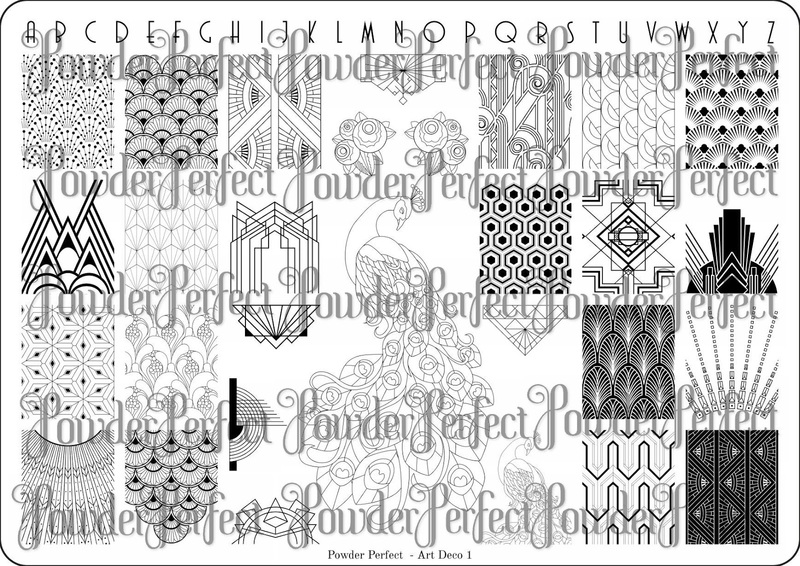 Powder Perfect have not only released a bunch of gorgeous polishes this year, they have also added stamping polishes (which you would have seen in my post yesterday) and stamping plates! 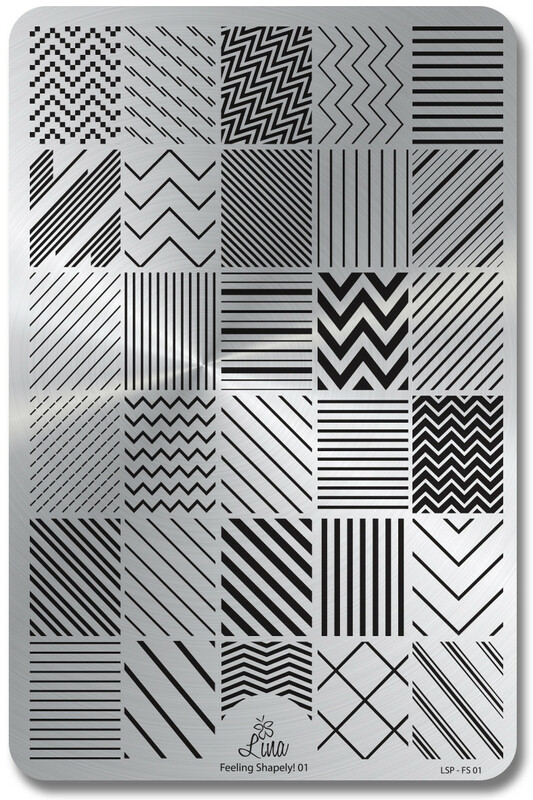 The plates they have released so far are a great quality and have unique images. There was one plate in particular that I fell in love with. Art Deco 01. You can see my swatches and review of this plate here. Pueen is another brand favorite of mine and has been for years. This year they have released three rectangular plates that made my heart sing and surprisingly they are all from the Theme Park Collection. You can check out that post here. 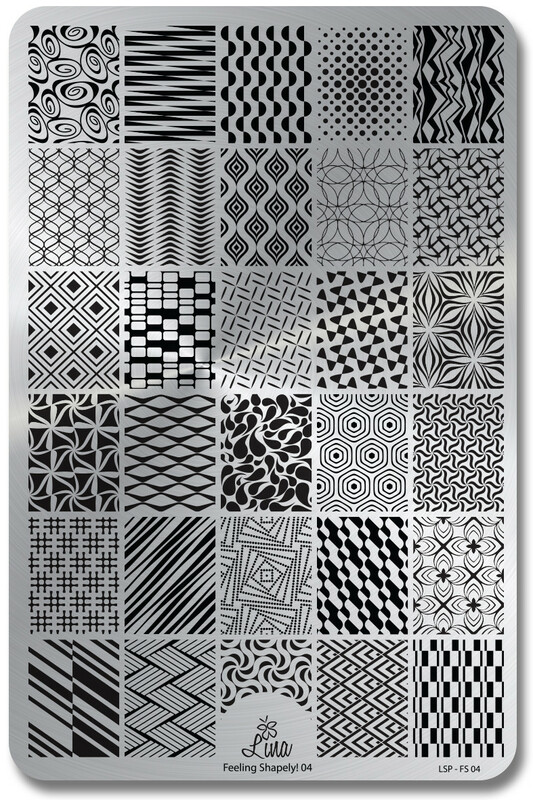 I'm sure that it comes at no surprise to you that I have a bunch of Uberchic plates in my line up of favorites. I'm pretty sure they have released more plates than any other brand this year. I could be wrong but I definitely know that my Uberchic collection has grown a lot this year! Collection Twelve. This is one of the collections that I couldn't decide which plate I liked best, so I just picked the full collection. You can see the images on each plate in this post as well as how I used them. 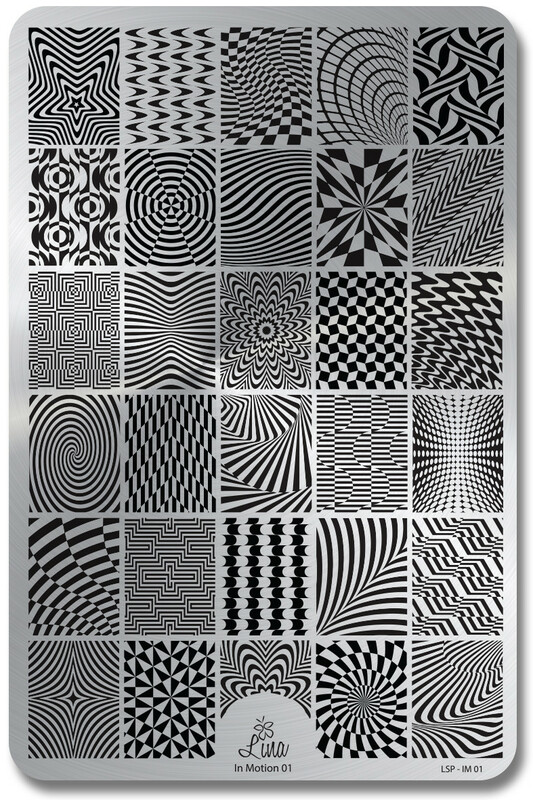 Op Art Magic. 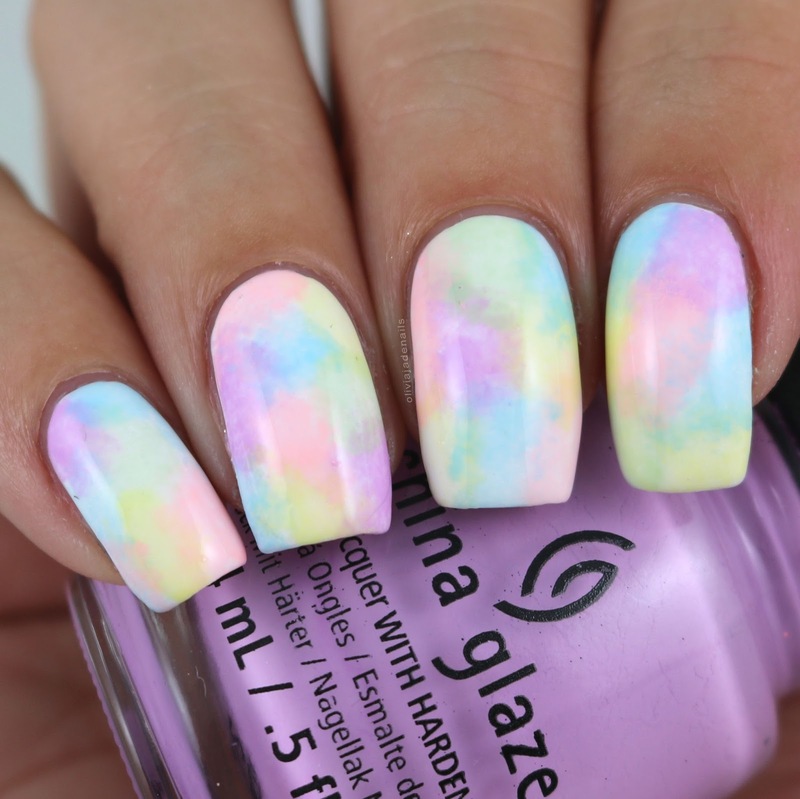 This is one of those plates where you can just do the most simple mani and it will just look awesome. 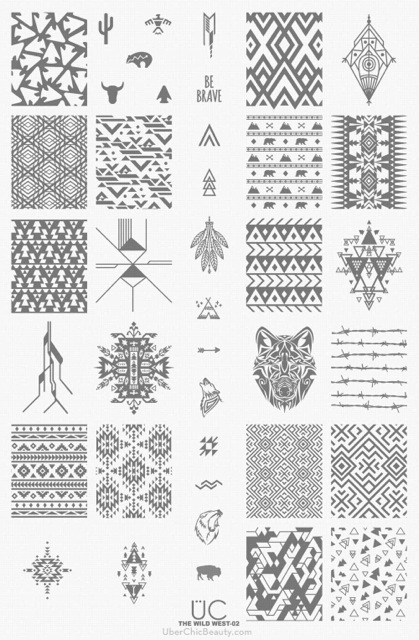 The designs are so cool. You can see some of the manis I did with this plates here. Wild West 02. You can see my blog post about this plate here. Texture-licious. You can see the blog post for this mini plate here. Seriously picking my favorite plates was so hard! 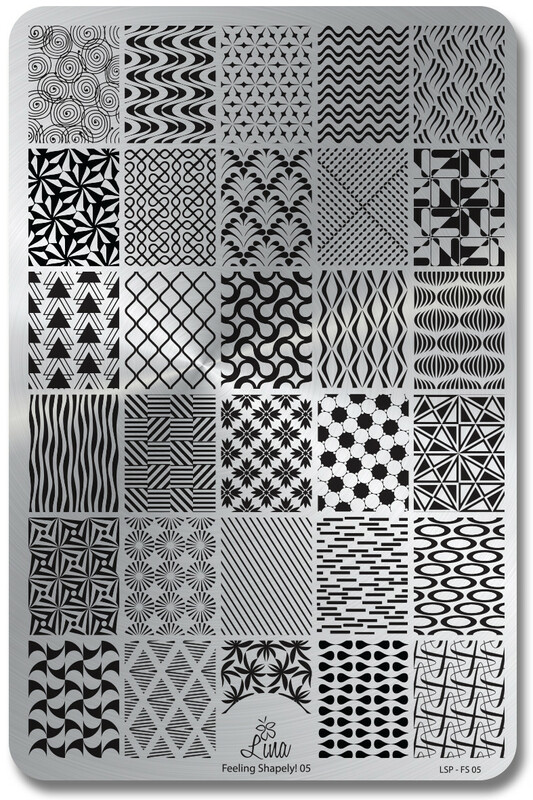 What are some of your favorite stamping plates? I'd love to know and check them out if I don't have them. I mean I could always do with some more stamping plates. 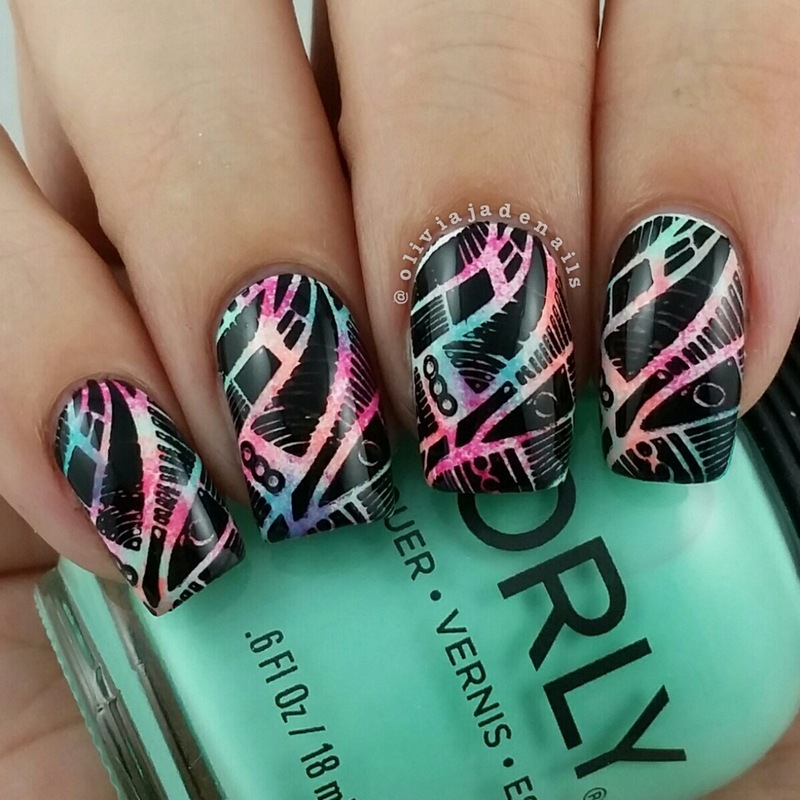 We can't talk favorites and not mention nail stamping. It's my go to form of nail art. It's quick, it's easy (ok so not always easy but for me it's much easier than free handing designs) and it looks great. All that being said I thought it would be a great idea if I share with you my favorite stamping polishes. I believe that most of these were released this year, however I am not 100% sure. They have all entered my collection this year so I am going with it. Like with my other favorites posts, these really aren't in any particular order. Shall we take a look? 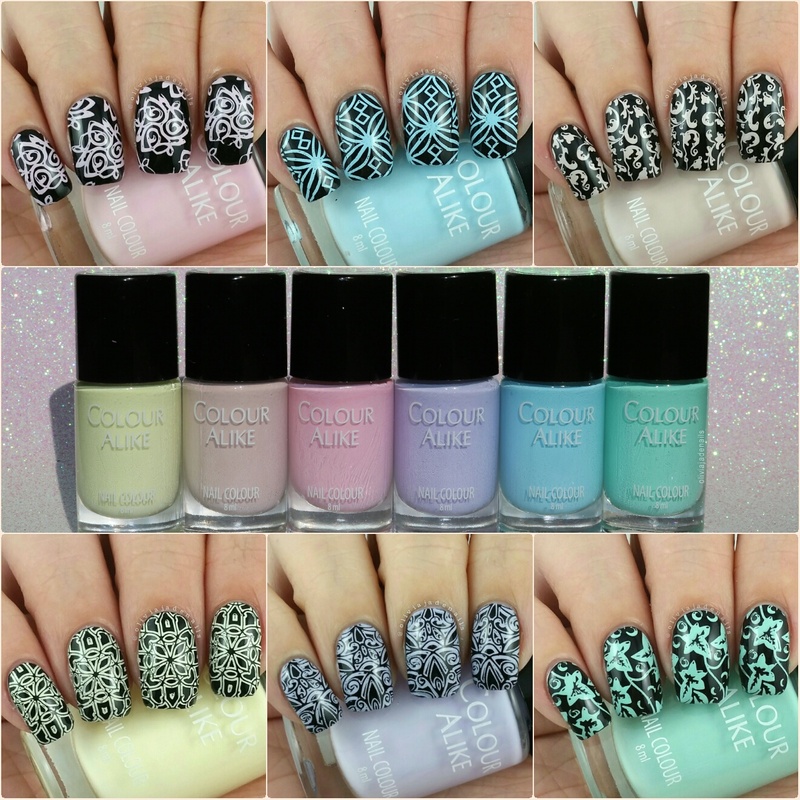 These brands were new to me this year and I just love some of their stamping polishes. They stamp well and the colours are gorgeous. 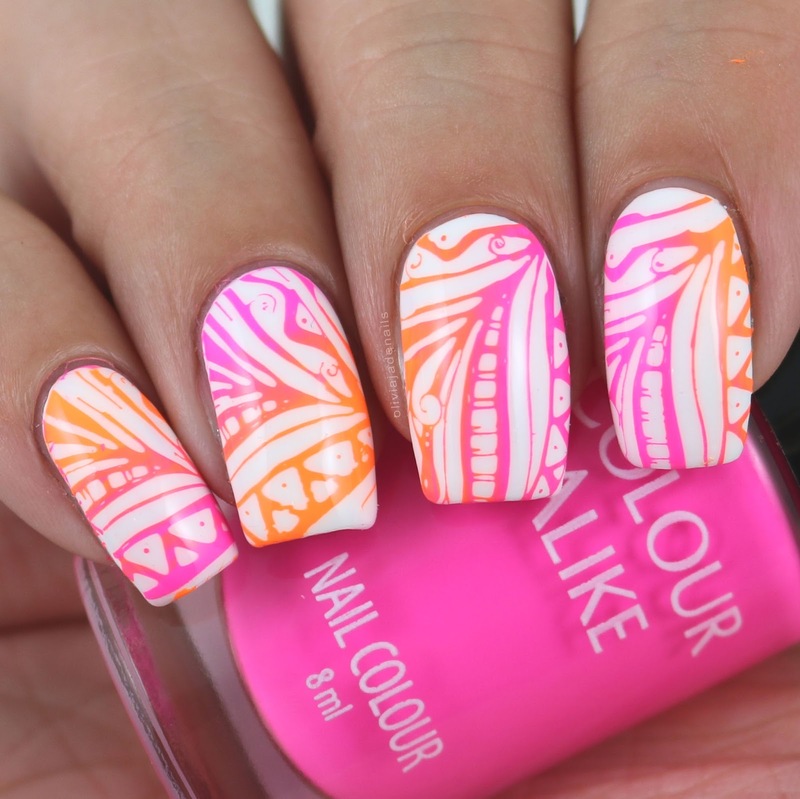 They have been some of my go to stamping polishes when it comes to colours. Now I realized that I haven't actually done swatches and reviews of some of these so I have included bottle shots and some of the nail art I have done with them. I promise to get around to swatching and reviewing them next year. Spring Break Collection. 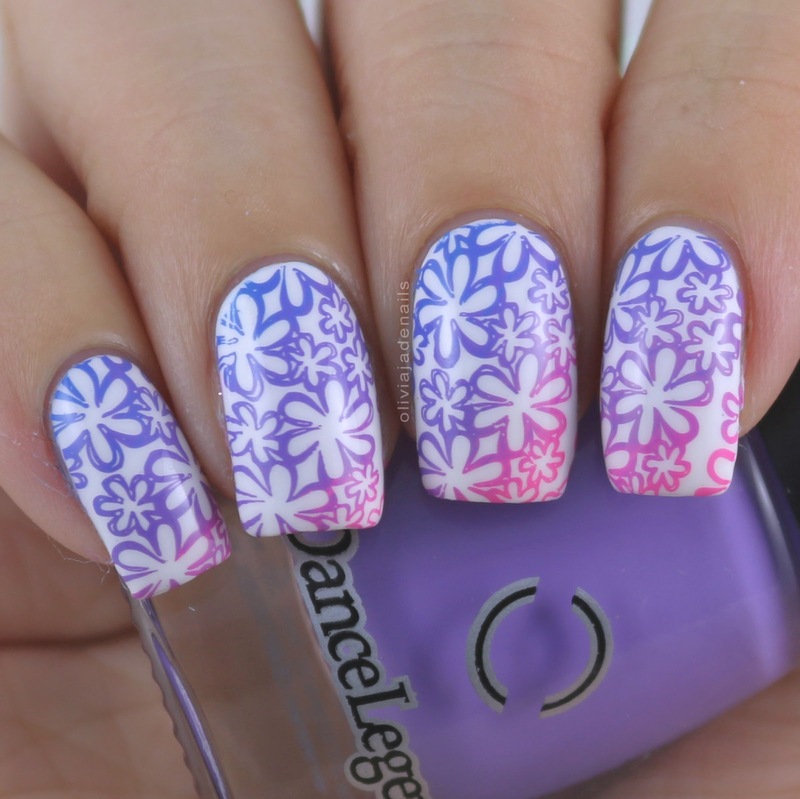 You can find the blog post on these stamping polishes here. 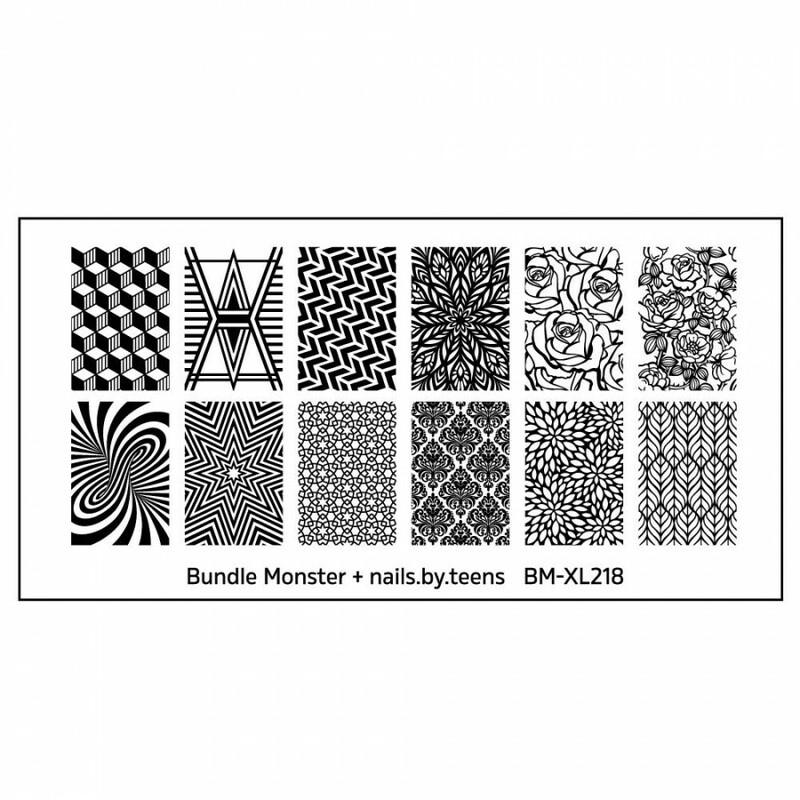 Bundle Monster are another new stamping polish brand for me. As you may know I was lucky enough to be sent four of their collections to swatch and review. I haven't quite worked my way through all four collections (I have only swatched three of the collections so far) but their polishes have made it to my favorites for the year. Electric Glo. You can find the blog post here. Weekend Warrior. You can find the blog post here. 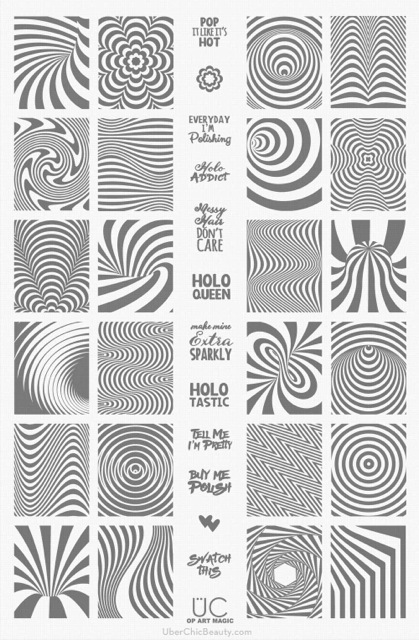 Psychedelic Stereo is from the Star Slinger Collection. 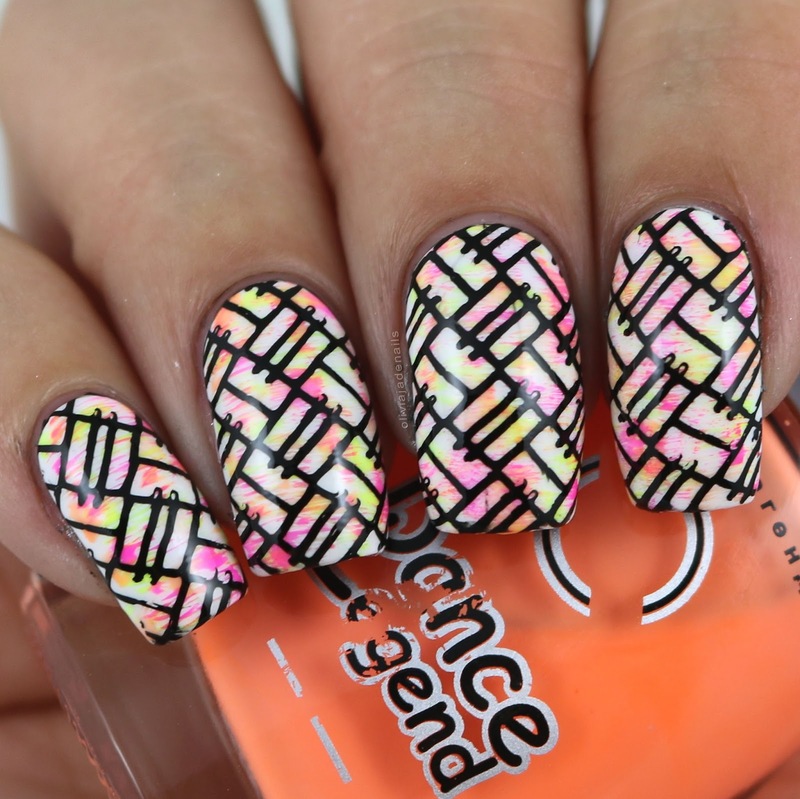 Dance Legend is another new stamping polish brand that I added to my collection this year. I now own six of there stamping polish and while I do really like all six, I would have to say that only four are favorites of mine. 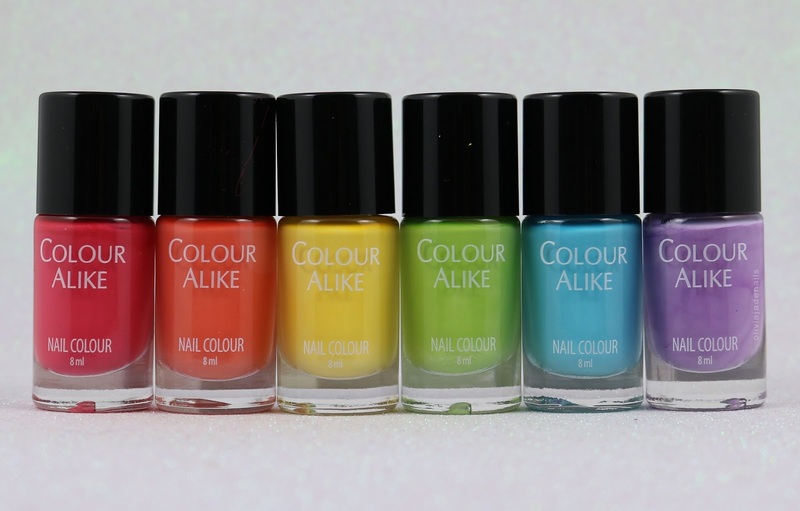 I will do swatches and a review of these polishes next year. From left to right: Pink, Purple, Blue and Mint. I am sure it is not going to come as any surprise that I am going to mention Powder Perfect's stamping polishes in my favorites for the year. I mention their Black Stamping Polish in at least 90% of my stamping posts, whether it's on Instagram or on my blog. 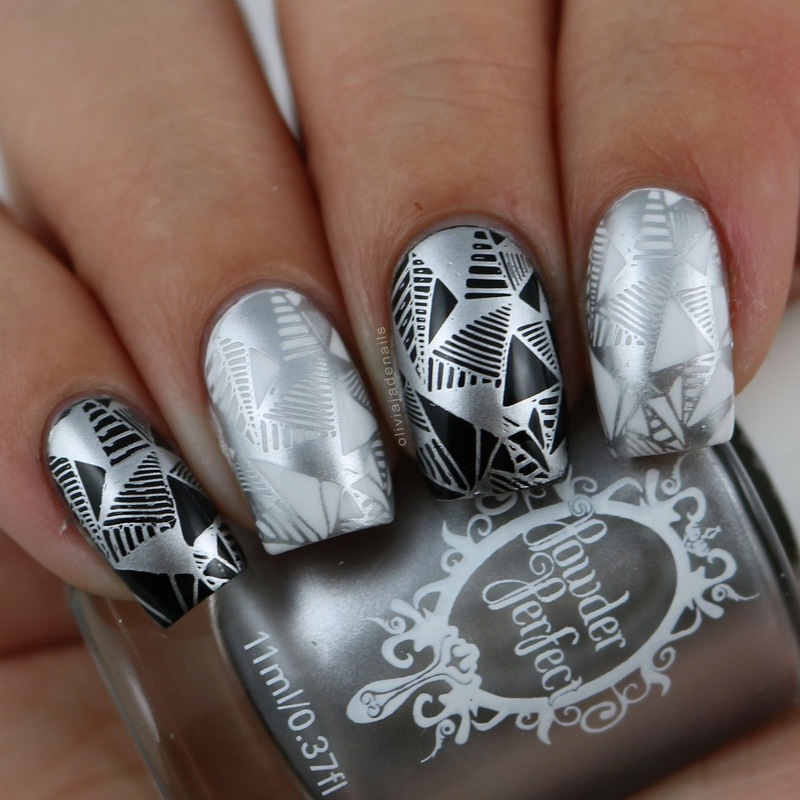 I seriously love their Black and White Stamping Polishes. 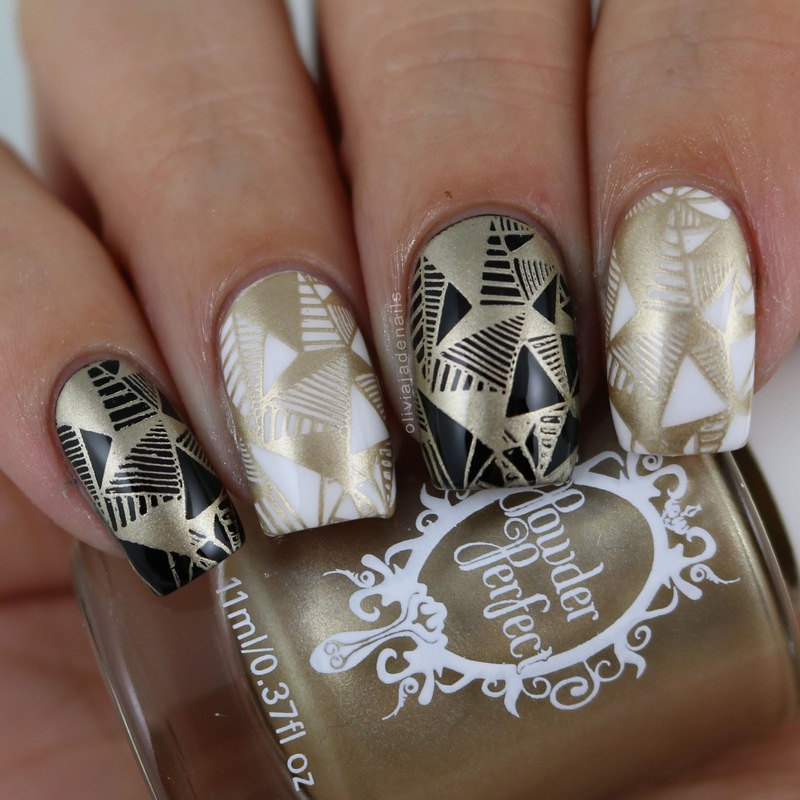 I am also including their Gold and Silver Stamping Polishes as my favorites. 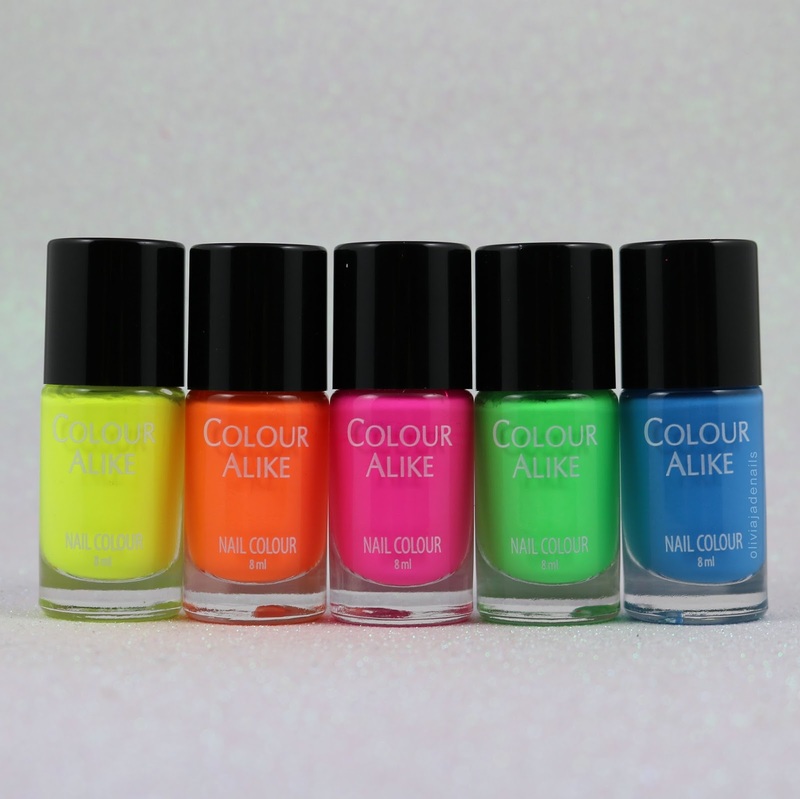 You can see my blog post on these polishes here. 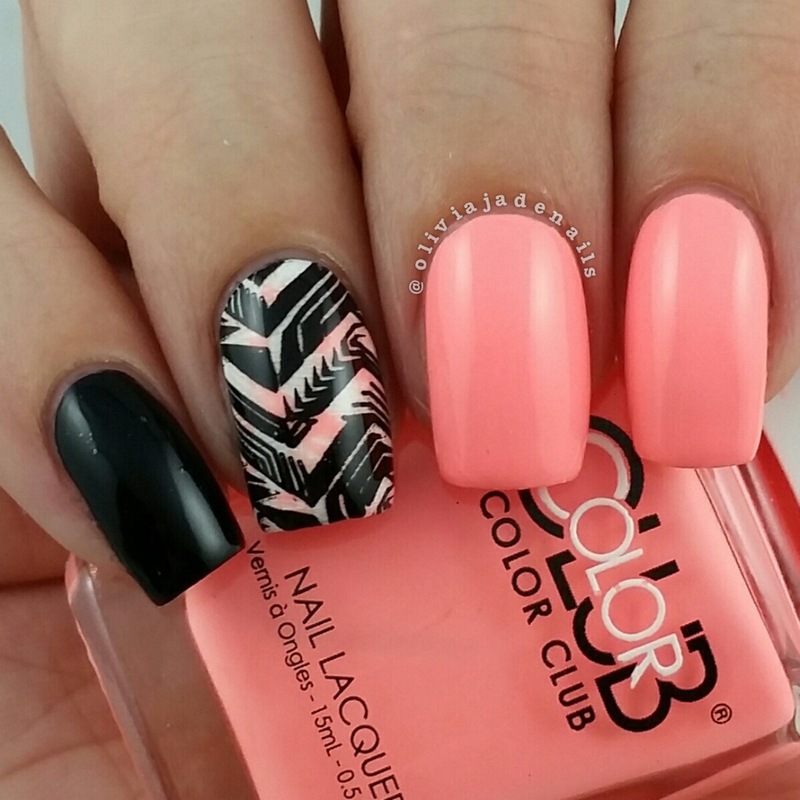 Black (shown on ring and index fingers) and White Stamping Polishes (show on pinkie and middle fingers). Best I am nosey and like to know things, let me know what some of your favorite stamping polishes are. Also if there are any of the stamping polishes I have mentioned above that you would like to see me swatch and review ASAP let me know and I'll add them to the top of my list for next year.